React Native runs on backhand server which starts when we apply the react-native run-android or react-native run-ios command on our command prompt screen. This command start will build up our Gradle project and start synchronizing the whole package using JS server. So when we close the server window this development server Error occurs. When you run the android project, then you will see "Could not connect to development server" error message in your android application. Ensure the packager server is running. 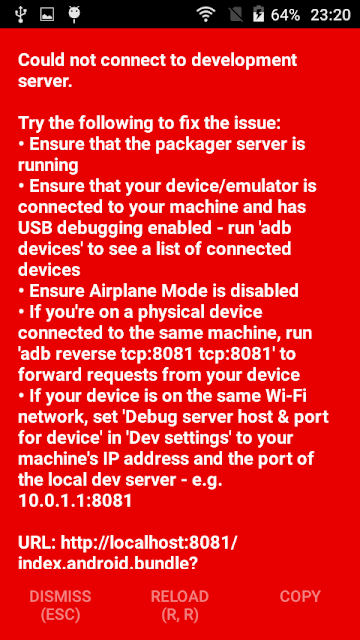 Ensure your device/ emulator is connected to your machine and has USB debugging enabled – run ‘adb devices’ to see a list of connected devices. Ensure airplane mode is disabled. If you’re on a physical device connected to the machine , run ‘adb reverse tcp:8081’ to forward request from your device. 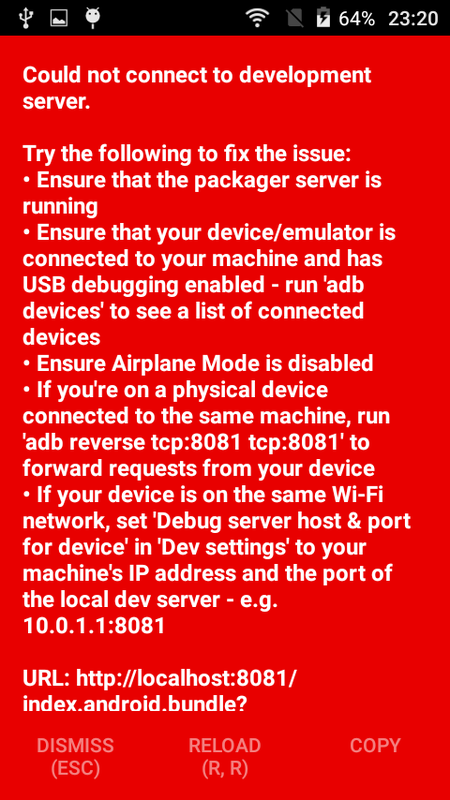 If your device is on the same Wi-Fi network, Set ‘Debug server host & Port for device’ in ‘Dev settings’ to your machine IP address and the port of your local Dev server – e.g. 10.0.1.1:8081. Step-2 : Then run the below command in terminal.